Cardboard Insanity: I love GOOOOOOOOOOOLD! - Dragon's Gold, that is. In my mind, any game not expressly banning negotiation is a negotiation game. If you play games with me, you’ll hear me throw around the offers all the time. Sometimes joking, sometimes not dead serious. I just love how even the offer of negotiation in a place where it doesn’t normally exist can throw some people into a tizzy. And sometimes, it even pays off and you get them to do what you want. I love games with negotiation and so a game that’s based completely around the mechanic is sure to get me fired up. So let’s go back to one of the classics of the negotiation genre. Way back in 2001, Bruno Faidutti released Dragon’s Gold for the first time. White Goblin did a tin version several years ago and now they’re partnering with IDW and Pandasaurus to distribute a nice boxed version in the US. Beautiful artwork and awesome gems make this game look great on the table. Dragon’s Gold is very easy to play. Each player has a Wizard with power 1, a Thief with power 2, a knight with power 3, and a knight with power 4. Four Dragon’s are dealt face up on the table. 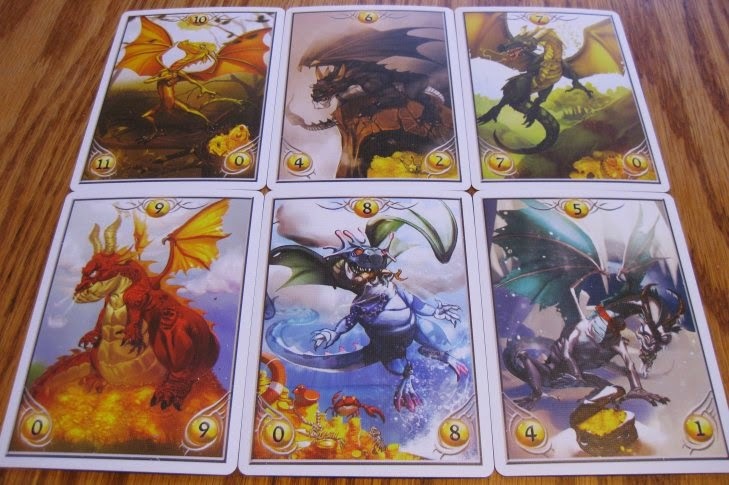 Each Dragon card has a treasure value in the lower left corner. Gems are drawn from a bag and put on each Dragon to match the treasure value. The gems are silver, gold, red (magic item), sapphire, emerald, amethyst, amber, diamond, or the elusive black diamond. On a player’s turn, that player must send one of his adventurers out to fight a Dragon by simply adding that adventurer to the stack of adventurers there. When the adventurer is added, you compare the total of the adventurers’ strength to the Dragon’s strength. If the adventurers’ strength is less than the Dragon, nothing happens. If it’s equal or exceeds the Dragon’s strength, the Dragon is slain and now the treasure must be divided. And this is where the game gets good. Real good. First, add treasure tokens to the Dragon based on the number in the lower right corner. Then, if only one player played a wizard there, he akes all the red tokens there. If there are multiple wizards then this is skipped. Anyone sending a thief gets to blindly take one token from one of the other players involved in this battle. If you play a wizard and a thief, you get to look and take the token. Now the fun starts! A sand timer is flipped and all players involved have 60 seconds to negotiate how to split the treasure. If there’s no deal by the end of 60 seconds, then nobody gets anything. It’s really that simple. Make a deal or everyone goes home empty handed. If a deal is made, you take your treasure tokens and put them behind your player screen. The game is over when all the tokens have been won or discarded. Players score points based on the gems they’ve collected with the winner being the one that scores more points. There is a bit of strategy about how you allocate your adventurers. You should always try to maximize the impact of your wizard and thief by watching the other players. The wizard can be especially useful if you can get him out when nobody else has one to play. Additionally, you want to make sure you cycle your adventurers so you’ve always got one to play. There’s nothing worse than getting stuck with no adventurers to play and being at the mercy of the other players to dictate the timing of the game. Also, you need to pay attention to which gems you are trying to get because you score points for getting a majority in a color. You’ll need to be cunning to negotiate exactly what you need. Also adding to the negotiation aspect of this game is the Market phase. 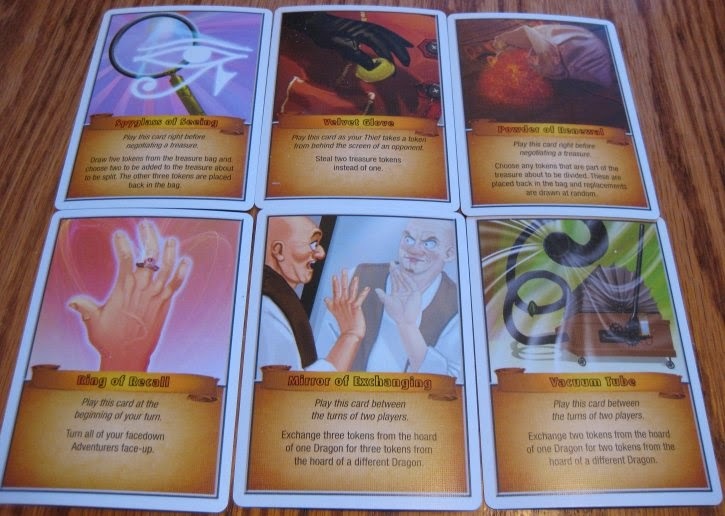 A market card is placed directly in the middle of the Dragon deck. When it comes up, players have the opportunity to trade gems to each other to try and work towards majorities. This carries a lot of deals with it as well. You want my gem? It may cost you during a later negotiation. The Market phase creates a nice break in the game and gives everyone a great chance to assess where the other players are at. Such a subtle piece of the game, but so integral into making this as awesome as it is. This new version does add a bit of extra rules through the new magic cards. These are definitely a fun way to add a bit of extra fun to the game without adding too much in the way of rules. 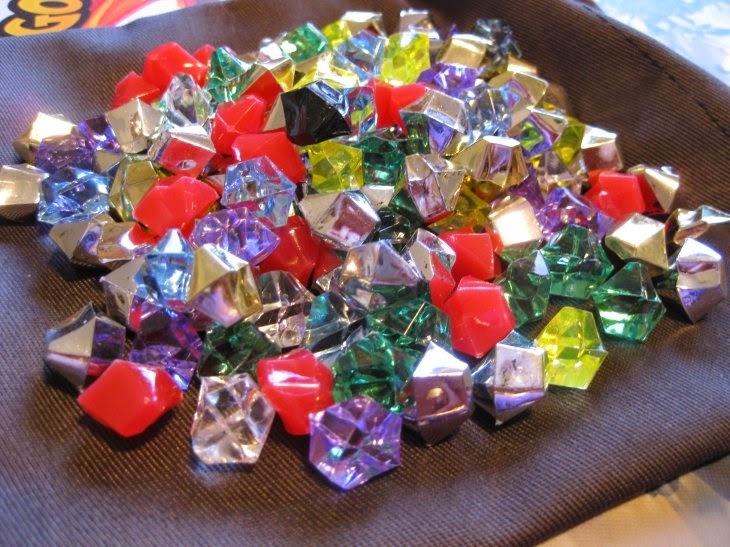 If you play with these, each player starts with one magic item and gets another one every time they get a red gem. This makes the wizards especially powerful. The cards have very specific text about when they can be played so there really shouldn’t be much in the way of questions about when and how they are used. The new advanced rules also offer a scoring variant which is a nice twist. I especially like the cursed black diamond. You will need to tailor your strategy around it, but that can add a fun new way to try and play the game. Of course, it can probably bite you badly if you don’t get what you’re looking for, but it’s always exciting to see if it will pan out. Front and back of the new and improved player screens. As you’ve figured out, there’s not much in the way of components here. 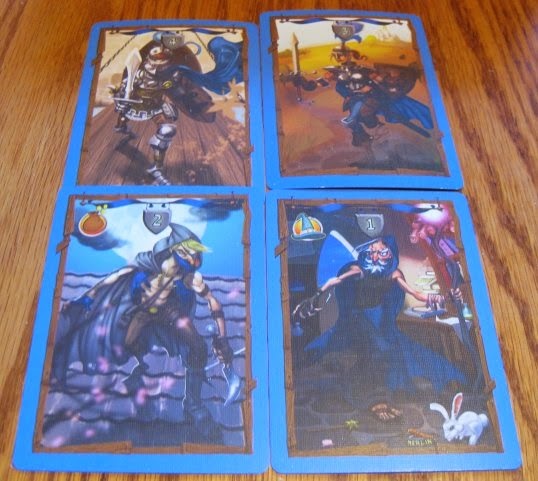 There are adventurer cards, Dragon cards, and magic cards which have a nice linen finish. The cards are a bit thin, but they aren’t getting handled very much so it’s not a big deal. One of the best things about the cards is that they have a thick colored border making it easy to see whose adventurer belongs to whom. Each player also gets a screen to hide their gems which is really quite important. This is a bit bigger than in previous versions and is now colored to match each players’ cards. Last but not least are the awesome gems. Previous versions of this game have come with wooden tokens which worked fine. This version, however, has really great looking gems. I’m a huge fan of these for two reasons: They look amazing and they don’t roll around. It’s a great touch on the presentation of the game and it makes it look like you get more for your dollar. You also get an a screen-printed gem bag to draw these from. Another great touch. It’s fair to warn you that if your gaming partners aren’t into the negotiation, this will flop. You have to have a thick skin to deal with someone constantly shafting you and not letting you get anything. It can be a tough pill to swallow. But if your group is big on schadenfreude then you’ll be in Heaven. You can mess with your opponents horribly as long as you are willing to take your lumps along with it. There is an optional rule for an “I cut, you choose” division of treasure, but that almost feels like blasphemy. Play the game as originally written and enjoy the pain on your opponents’ faces. 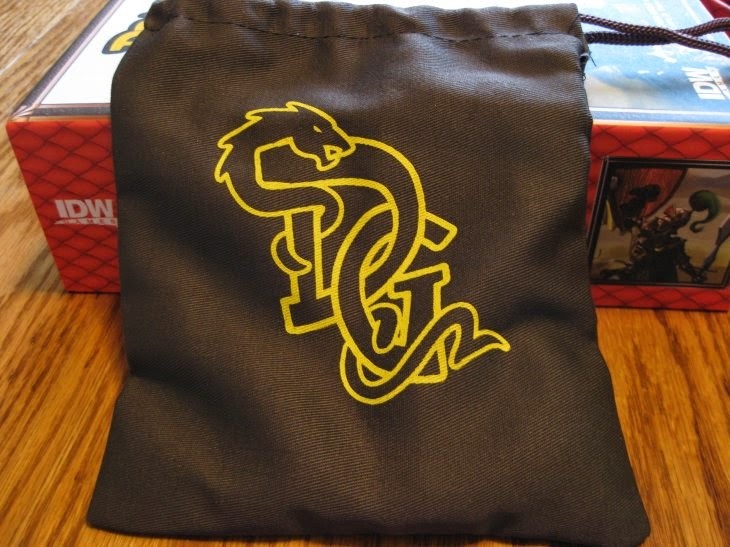 The screen printed gem bag is an awesome touch. I can’t say enough good things about Dragon’s Gold, especially this newest version from IDW and Pandasaurus. It’s a perfect distillation of a mechanism with just enough parts bolted on to make it a touch more robust. Faidutti created a real classic in 2001 and that’s validated by the fact that it’s still being sought all these years later. IDW and Pandasaurus made a great call on this one and I’m sure it will pay dividends for them. The fact that they gave it a nice production really helps push a great game into “must-have” status. If it sounds like this is a simple game then you are right. It couldn’t be much simpler. But that’s the beauty of this game. It’s a nod to the older days in game design when less was more. Dragon’s Gold is a negotiation game boiled down almost as far as you can get it and still have any sort of game outside of the negotiation. It accomplishes a very specific goal and does it with almost no tacked on ideas or bloat. This is almost a perfect game and has earned its status as a classic. This new version will help cement it, and its designer’s, legacy. Kudos to Pandasaurus for doing an outstanding job getting this one back into print.